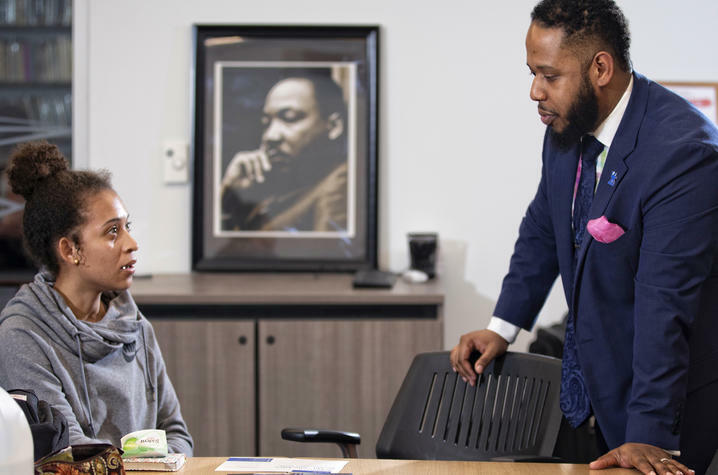 LEXINGTON, Ky. (Feb. 7, 2019) — As it turned out, Jason Brooks’ first steps on the University of Kentucky campus were a reliable predictor of how he chose to tackle leading its Martin Luther King Center — by listening carefully to all those around him, especially the students; weighing alternatives; and carrying through. Hours before the initial interview for the MLK Center director’s position, Brooks decided to take an anonymous walk across campus, talking to students, faculty and staff he encountered along the way. His primary question: What’s UK really like? He liked the anonymous responses. So much so, he had all but made up his mind before administrators offered him the job. "I am very excited to have Jason join our campus community as the new director of the MLK Center,” said Vice President for Institutional Diversity Sonja Feist-Price when announcing Brooks’ appointment last summer. “He is extremely knowledgeable about issues involving diversity, equity, inclusion and belonging, and Jason's leadership skills, strategic vision and interpersonal skills will be instrumental in helping us broaden the scope of the MLK Center, while also maintaining a community of belonging and engagement for African-American and Latinx students." Serving the entire university, Brooks is responsible for strategic oversight of many of the most integral institutional initiatives focused on diversity, inclusion and belonging that impact thousands of students, faculty, staff and other community members each year. He and the center play a key role in the recruitment, retention and graduation of UK’s diverse student population, and he collaborates with faculty and staff to support a welcoming and sustaining campus climate. Working from the new, state-of-the-art, inclusion-focused Martin Luther King Center in the newly constructed Gatton Student Center, Brooks regularly interfaces with and contributes to national social justice dialogues as well as students’ conversations right outside his office door, which always stands open. With the vision and temperament to collaborate effectively and efficiently with other institutional diversity directors and key stakeholders across the campus and Commonwealth, the director fosters new and expanded intercultural and cross-cultural dialogues. He supervises a fulltime professional team with the flexibility to incorporate scholarship and teaching. 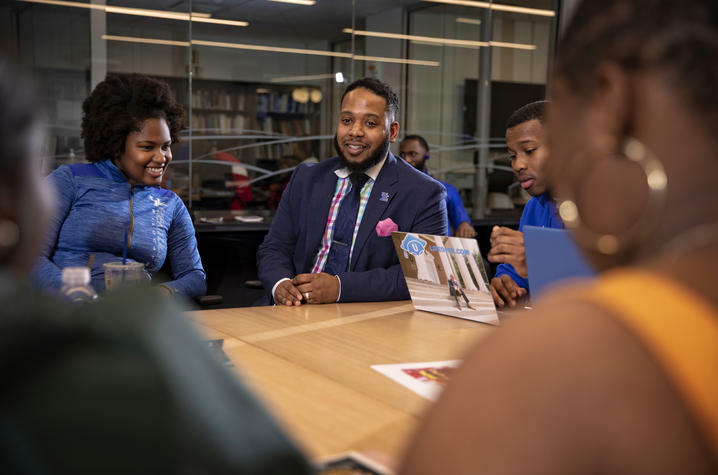 He has taken that support and created a whirlwind of initiatives and priorities for the MLK Center this spring semester and next academic year. This semester, already 67 or more programs are scheduled within or in conjunction with the center. The center is also used by student organizations as meeting space, as well as informal meeting space for other groups and individuals. He is especially proud of “DEEP of UK: A Diversity Retreat,” which he hopes to initiate soon. DEEP stands for develop, encourage, extend and provide. Brooks envisions an overnight diversity leadership retreat for UK students to gain knowledge and training on issues of multicultural education, the cycle of socialization, power and gender dynamics, and oppression theory. He hopes students will leave the retreat with a personal impact action plan that will allow them to make an impact in their community as well as promote and foster a stronger campus environment. “We want students to dig ‘DEEP’ in each other’s stories and experiences. It’s all about building community and understanding each other’s life stories,” said Brooks. 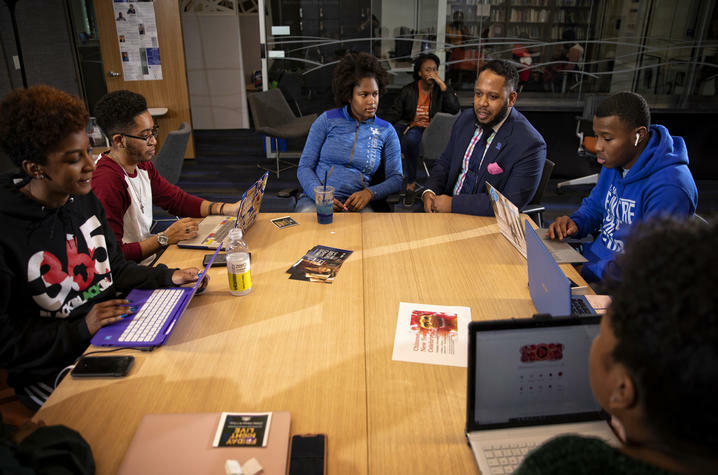 He is also in the process of developing a one-day summit geared towards diversity, social justice, and leadership for current UK students and prospective multicultural high school juniors and seniors. The mission of this summit will be to “support, encourage and inspire students to achieve the unexpected while establishing a standard of excellence in all that they seek to accomplish through scholarship, leadership, professional development and service,” Brooks said. He’s also planning a program that could make the King Center a central hub for an Ambassadors for Inclusive Excellence program. Brooks said he is most proud of the fact that he has overheard students call his center “the living room of campus,” making it “the most utilized and frequently used area of a home,” he said. “Students, faculty and staff come to just relax, debate, play games, read, study and eat. Some of the best community-building opportunities are done within our informal setting and structure,” Brooks said. “To a lot of our students, the MLK Center is home. They see themselves in the professional staff, they relate to the staff, they connect with the culture we’ve created within the space.